A neutral sans for the 21st century, MVB Solitaire™ sits nicely between humanist and gothic, its practical yet lively manner well-suited to contemporary typography. In crafting his latest family, Mark van Bronkhorst paired graceful, functional forms with an arsenal of thoughtful technical features. MVB Solitaire™ brings eleven weights with companion italics to the table, a true workhorse for the discerning designer’s toolkit. 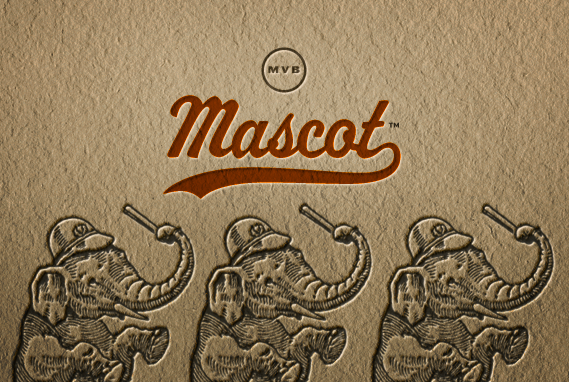 From the dugout to the desktop: this jaunty varsity script evokes the spirit of sports and simpler times. Drawing inspiration from a vintage iron-on alphabet, Mark van Bronkhorst has fashioned a casual but well-mannered script with support for all Latin-based languages. Requisite underline swooshes included. New from Sweet®: Sweet Square. Sweet Square is the latest addition to MVB’s Sweet® collection of typefaces inspired by engraved lettering styles from the first half of the twentieth century. The engraver’s square gothic has been one of the more widely used stationer’s lettering styles since about 1900, made popular long ago by bankers and others seeking a serious, established feel to their stationery. From antique engraver’s “masterplates,” Mark van Bronkhorst has produced a family of 54 OpenType fonts in nine weights. A PDF specimen showing the fonts and features can be downloaded here.